A (seemingly) simple question: What is the goal of business networking? The goal of most business networking is to make new connections in order to get more business. The goal of trust-based networking is to help others develop their businesses. The “collateral benefit” of trust-based networking is that others then help you. When it comes to networking, injecting trust into the picture creates a sort of paradox. It’s exactly the same paradox that arises when we think about injecting trust into selling, or advice-giving, or getting people to review your books. That paradox was expressed well by Dale Carnegie, Zig Ziglar, and a host of others: basically, the best way to get what you want is to help others get what they want. It’s easy to forget how radical that proposition is; and how infrequently people actually do it. During interaction, you focus on finding pain points (waiting to offer solutions at a later time). If that roughly resembles what you do, then please take note: all three of those benign-sounding activities share one trait – they’re all about you. They are not activities that put Dale Carnegie’s insight into practice. You focus not on pain points, but on being genuinely curious and seeking perspectives. Those are very different activities: they’re not self-focused, they’re other-focused. And, they are more likely to result in relationships and in interesting conversations. It is those relationships and conversations that result in true connections of interest – and before very long, in leads and business development conversations. The “collateral benefit” of behaving this way is – leads and sales. In fact, more leads and more sales than if you go in with the usual self-centered approach of trying to get leads and sales directly. But the paradox must be respected: if you engage in these other-focused activities as mere fig-leaf cover for your true goal of getting more sales – it won’t work. We all see through such base motives. You actually have to commit to the alternative goal – that of helping others. 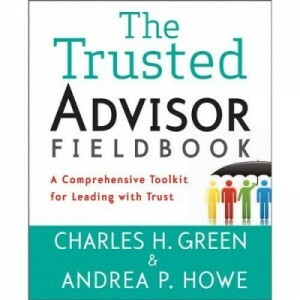 Learn much more about this strategy at our next Trust Matters webinar: Network Like a Trusted Advisor: Take the Work (and Stress) Out of It, January 29th (11AM EST) delivered by my partner and co-author of The Trusted Advisor Fieldbook, Andrea Howe, together with Stewart Hirsch, our head of business development and leadership coaching (and CEO of his firm Strategic Relationships). Sign up for the (free) webinar here. http://trustedadvisor.com/public/trusted_advisor1.png 0 0 Charles H. Green http://trustedadvisor.com/public/trusted_advisor1.png Charles H. Green2019-01-21 06:01:582019-01-19 18:00:44Trust-based Networking and the Paradox of "Collateral Benefit"